Remember Louise? She is the one with a tibia/fibula fracture with long leg cast on her right leg, a femur fracture with an external fixator on her left leg, a large ulcer like lesion on her lower back and many scrapes and scratches all over her body. She is also the one who had a massive infestation of worms. And the one who was abandoned by her family. She's the one with the very sad story but with a continuous smile on her face. She is one of my heroes. 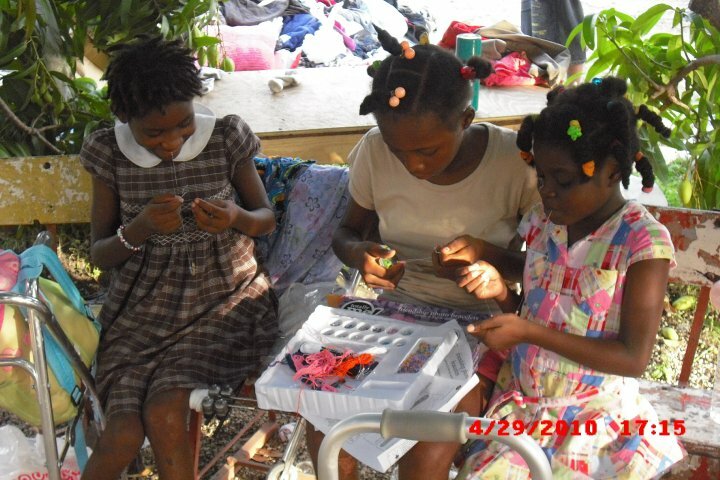 I recently heard from a friend who is still in Haiti that Louise is still at the orphanage. 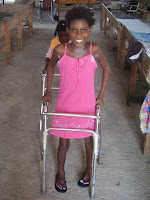 She ended up having to return to Medishare Hospital for a skin graft due to a swollen leg/foot, likely an infection. And her bones are healing VERY slowly. She no longer has the cast but still has the pins in her upper leg. However, despite everything, Louise continues to smile and enjoy life. I have no idea what the family situation is like at the moment, but hope that Louise feels loved and accepted at the orphanage. You can see her practicing to walk in the photo above and see how she is enjoying time with her new friends at the clinic/orphanage (pictures from left to right are Louise, Nancy and Founa). I am hoping for continued physical and emotional healing for all of them as all three of them are still there. Keep it up girls! You can read the other posts about Louise here and here.